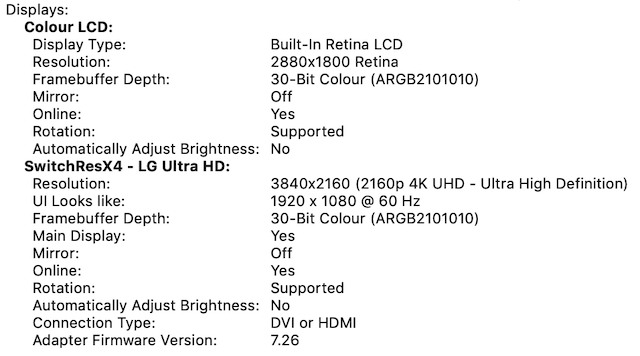 I've got 2018 MacBook Pro 15" (Radeon Pro 560X), which I'm connecting to external LG 4K display (27UD69P-W) via Satechi Type-C to HDMI Adapter (says 4K/60hz on the box), but the display is running 30hz. How do I make it do 60hz? Enable DisplayPort version 1.2 in the monitor's menu. Choose "Resolution: Default for display" in my Mac's System Preferences/Displays. 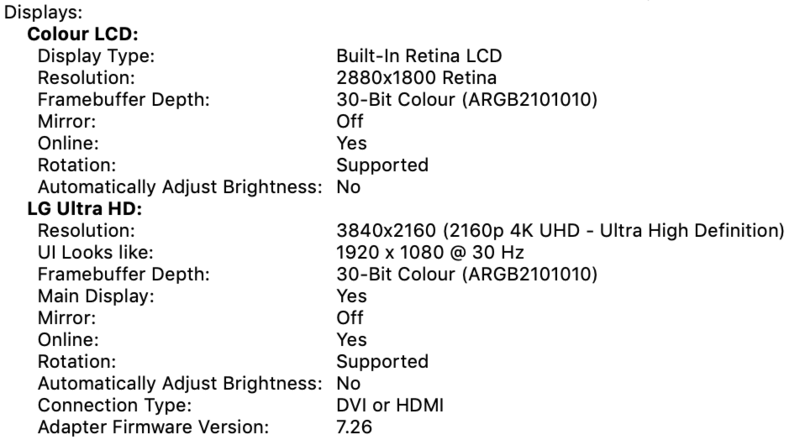 The first point is pretty obvious, given that DisplayPort 1.1 only supports 30Hz for 4k. And this setting delivered 4k@30Hz. Choosing "Default for display" changed it to 60Hz. After that, even re-selecting "Scaled" keeps my monitor at 4k60Hz. What I believe might have happened is, that when I had first connected the display, it was still set to DisplayPort 1.1, and I assume my Mac remembered this. Resetting SMC/PRAM didn't seem to help. 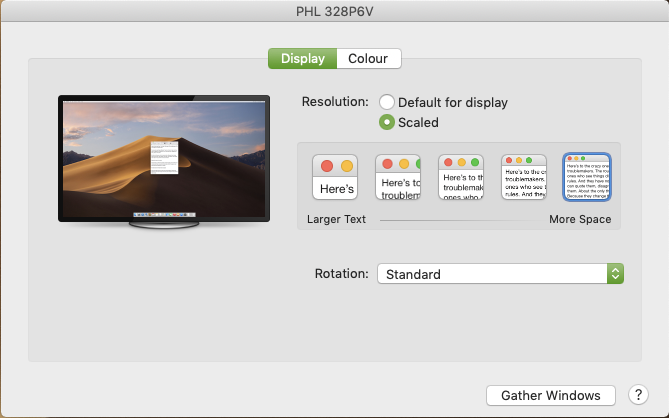 Switching the Resolution selector in the System Preferences probably made macOS rescan the connection and remember the updated DisplayPort 1.2 capability. SwitchResX. It has weird UI, but it works! My display is now recognised as "SwitchResX4 LG Whatever" and does in fact run 60hz. It's not free, but I haven't found a better solution yet. I’ve had better luck using USB-C to DisplayPort with macOS to achieve 4K@60hz. Something with HDMI 2.0 was a bit of a tweak to that standard. Even using Win10 I had to specifically go into the NVidia settings and tell it to use the UHD profile to achieve 60hz over HDMI 2.0. I imagine SwitchResX is giving you that capability. I have had the same problem with that exact cable (Satechi) and a 4k TV. There is a problem with those active adapters & cables on the MacBook Pro 2017 & 2018 models. Please check your "USB" category on System Profiler, does it state that the cable is connected as "BILLBOARD 2.0" under the USB 3.0 category? For me it seems that we can't activate the "DP Alt Mode" on these thunderbolt ports (for no apparent reason). And that's why you are getting 30hz. Not the answer you're looking for? Browse other questions tagged display 4k .